This is a comparison of two pairs of earbuds. One of them is Powerbeats 3 from Beats and the other one is X3 from Jaybird. Both of them are designed to be used for fitness and workout. We will check which of them has a better design, how good are they when it comes to keeping the connection, how long you can use them before you need to connect them to a power socket, and, of course, how good they sound. Check the comparison and decide which one is better for you. Beats didn’t change the design of Powerbeats 3, they look the same as before, with the obvious Beats logo on the side. The headphones come with a collection of pads to ensure the seal – although it doesn’t work every time, and the noise isolation is not perfect. The earbuds have the special hooks to keep your earpads inside your ears. This also has some disadvantages – after a few hours, you can feel a bit of discomfort. The earbuds are equipped with a remote to control the volume, skip tracks or take a call. The device is available in a few different color schemes: black, white, asphalt grey, break blue, brick red, flash blue, shock yellow, siren red, trophy gold and turf green. Because these are fitness headphones they should survive sweat and rain, but don’t try to submerge them in the water. The X3 earbuds are the successor of X2. Jaybird, contrary to Beats, changed slightly the design of its newest headphones. It’s built from the same plastic as before, but this time it resembles brushed aluminum. While Powerbeats 3 comes with hooks that should keep the earbuds in your ears, Jaybird takes a little different approach – instead of hooks they use fins. This type of design is more stylish and more comfortable, especially if you are planning to use your earbuds for more than few hours. X3 comes with the additional sizes of foam and rubber tips to give you more sound isolation. The remote controller is similar in size to AA battery with three buttons to control your earbuds. long-press to turn off the headphones. Both headphones come with a special clip to shorten the cord behind your head and deal with the cable clutter. Remember that both models have small drivers that cannot deliver such powerful sound as over-ear headphones. The other thing that you have to take into consideration is that they are the Bluetooth headphones, and wireless headphones are by definition worse in delivering high-quality sound than wired headphones. The sound in Powerbeats 3 is the same as that of Powerbeats 2, nothing was upgraded here. If you want to get the best experience from these headphones, you should try to get a perfect seal, otherwise, they sound average, and there are a lot much cheaper headphones that will give you a better experience. When you get the perfect fit, you will get pretty open sound with a great detail. The bass is quite powerful and sometimes can be a bit overpowering, especially when you want to relax and listen to music, instead of running or exercising at the gym. Treble seems to be a little weaker than bass, it’s not bad, but not perfect either, especially for headphones in this price range. Jaybird X3 happens to have a very good flat sound signature. It means that you can modify its frequency to fit your personal needs. It can be done with the application called Jaybird MySound, available on Google Play or App Store. You can add more bass if you are an EDM fan, or treble if you want to listen to vocals or classical music. You can build your own shape and save it, or choose one from many pre-built or community-based signatures. After you save your settings, the program knows everything about the type of the headphones you are using, battery level, or the sound signature you’ve chosen. The sound signature will never be reverted back, even if you pair your earbuds with a different device. Some people complain about lack of bass, right after they use these earbuds. What you need to do is to change the default ‘signature sound’. After you add more bass they sound great. The bass is tight and not overpowering. Treble seems to be faithfully delivered in these headphones. The high note instruments and vocals are crisp and detailed. The Powerbeats 3 earbuds are equipped with the newest Apple’s chip, called W1. While you can connect these headphones to an Android phone, they are specifically designed for Apple products. Just place it near your iPhone, and after a second you will see a confirmation screen. Once you connect these headphones to an iPhone, they will also be recognized by other devices from the Apple family, without lengthy pairing sessions. With this new chip, you get an extended range, much beyond the standard 10 meter. You shouldn’t have a problem to get at least 30 meters, even when there are many active networks in your vicinity. Although Jaybird X3 doesn’t offer such a big range as Powerbeats 3, the connection stays strong within 3 meters. I was able to connect these headphones to iPhone and Android in about 10 seconds. Jaybird offers the Bluetooth 4.1 connection. This standard allows you to connect two pairs of earbuds to one device or one pair of earbuds to two different devices. It’s very useful if you are constantly switching between different devices because you can do it without disconnecting them. 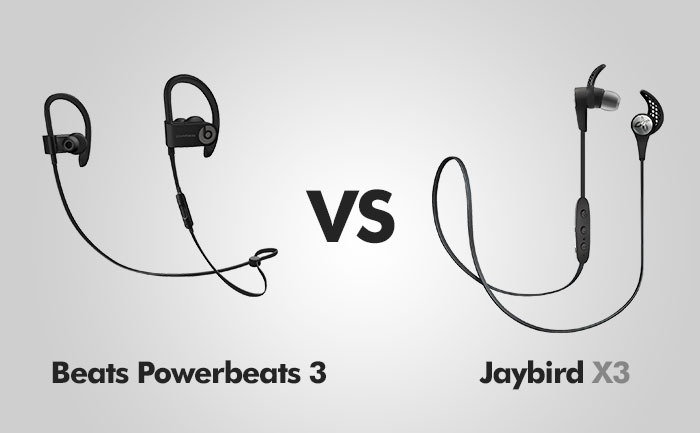 In this category, Powerbeats 3 has the biggest advantage over Jaybird X3. You have 12 hours of continuous playback – which is 4 hours more than Powerbeats 2 or Jaybird X3. If you are out of juice, you can always plug them for 5 minutes and get 1 hour of battery life. This model charges via the popular micro-USB connection. Jaybird doesn’t offer charging via USB, as its competitor does. To charge your device, you have to use a special cradle with metal pins. The disadvantage of this method is that you have to carry the cradle with you, but it fits into the carrying case, so it’s not a huge problem. The advantage of this solution is that they are fitness earbuds, and when we talk about fitness, we talk about a lot of sweat and dirt that you have to deal with. If the micro-USB port gets dirty headphones may stop working. There is no such problem with a cradle. PROS: Great battery life / Great range / Simple pairing with Apple products / Good sound quality / Stay in ears / Sweat-proof. PROS: Good sound quality / MySound app / Bluetooth 4.1 / Sweat-proof. CONS: According to Amazon reviews they break down very often / After a few hours you can feel discomfort. CONS: Bluetooth range. Powerbeats 3 are nice earbuds, but for such a high price I expect better quality. The important issue that many people seems to have with this model is that it breaks a lot. Although I didn’t have any problem with them, many users on Amazon give them a lot of negative feedback. If you don’t need 12 hours of battery and really big range, I would definitely go with Jaybird X3.